Bible Journaling Ministries (BJM) exists to encourage others to spend more time in the Word; growing closer to God each and every moment. Our mission is to help women to grow in the Word, creatively. Our Affiliate program is developed to provide a source of income for other Christian businesses and bloggers who are as excited about our products as we are, and want to share them with the world. 25% commission on all monthly or annual kit subscriptions. Opportunity to receive Momentum subscription for free if you generate $100 in quarterly sales. Applying for our Affiliate Program is Easy! There are no costs associated with becoming an BJM Affiliate. Complete the form below to apply. You will be notified if you are selected. Here are our Terms and Conditions. An affiliate program allows selected affiliates to promote BJM products and receive a commission based on sales. You will be given a tracking link unique to you that you can use in your blog, social media platforms, email campaigns, etc to reach potential customers. Remember: It is your responsibility to stay compliant with FTC regulations. You must mention that you will get a commission prior to providing your link. Everyone is welcome to apply! Whether you run a personal blog, have a social media following, have a newsletter that is Christian-based, or anything in between you’re welcome to apply to join the program. All applications are manually reviewed, and we reserve the right to refuse any application, especially if the site or e-mail list contains objectionable material, participates in unsolicited e-mailing, or doesn’t serve a Christian-based audience. How do you know if the customer sale came from my link? An affiliate’s link will set a “cookie”, or tracking code, on the potential customer’s computer. If they purchase within 60 days of clicking your link, you will get the affiliate commission for that sale. If they click another affiliate’s link after yours, you will not get credit. 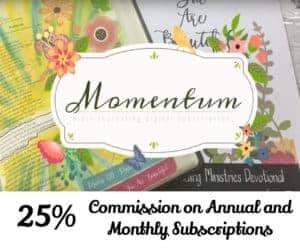 Bible Journaling Ministries is currently offering commissions for Momentum, a monthly devotion subscription. Customers can pay monthly or purchase an annual subscription. Affiliates will earn a base commission of 25% the sales price. For customers who select a monthly subscription, you will accrue a commission as long as they remain customers without a break in their subscription. For the customers who purchase an annual subscription through an affiliate link, the affiliate will receive a one-time 25% base commission. We do not have an affiliate program for our e-commerce store. Bible Journaling Ministries will pay commissions every month to the PayPal account provided. There will be a minimum threshold of $50 for payout. Any commissions below this threshold will be rolled over to the next month until the threshold is met. Upon acceptance into our Affiliate Program, you will be provided with access to your personal Affiliate Program Center. You will have access to marketing collateral, sample emails, your unique tracking link and your stats showing traffic and sales you have had with your tracking link. Once your application is approved, you will receive an e-mail welcoming you into our affiliate program. It will include all the instructions you need to get started. By participating in the Bible Journaling Ministries Affiliate Program, you agree to our Affiliate Terms and Conditions. Please contact us if you have any questions about these Terms and Conditions. Remember: It is your responsibility to stay compliant with FTC regulations. You must mention that you will get a commission prior to providing your link.